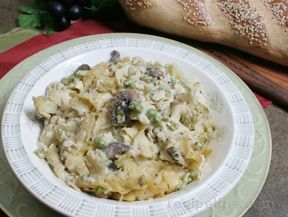 Chicken and noodles mixed with a savory mushroom sauce makes a delicious, easy-to-make casserole that everyone will love. In a large saucepan, cook the noodles according to the package directions. Drain the water from the noodles after cooking. Preheat the oven to 350ÂºF. 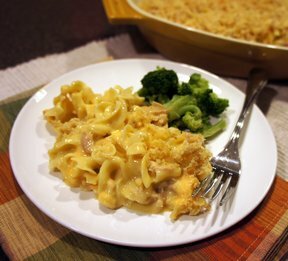 Coat the casserole dish with butter or nonstick cooking spray. In a large bowl, add the cooked noodles, canned chicken (drained), and the mushrooms. Stir to combine. Blend in the sour cream, milk, and seasonings. 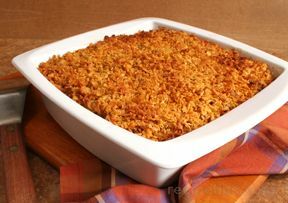 In a small bowl, combine the parmesan cheese, bread crumbs, and butter. Sprinkle this mixture on the top of the casserole. Dust the top of casserole with paprika if desired. Bake 35 to 40 minutes, until golden brown and bubbly. "I am pretty new at cooking so after reading the reviews wasn't sure on how to change the recipe but I ended up leaving out the mushrooms and added a can of cream of mushroom soup instead. I also topped it with French fried onion rings instead of the bread crumb mixture. It turned out pretty good; even my husband said it was good." "To kitchentimes: It is too bad you won't even try this recipe. 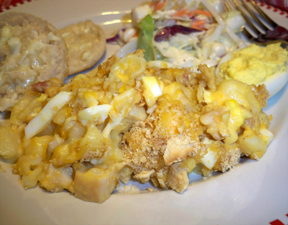 It is an easy recipe to make for a family and it is pretty good even when using canned chicken. There are some very good brands of canned chicken available but if you are truly against using canned chicken, you could substitute 1 1/2 cups of cut up rotisserie chicken instead. I hope you will reconsider this recipe." "ARRGGHH!!! Stopped cold by "canned chicken"!!! I can't believe a modern recipe site would list a recipe with a rotten ingredient like this." "Was a little dry and needed something to give the sauce a little more zing."